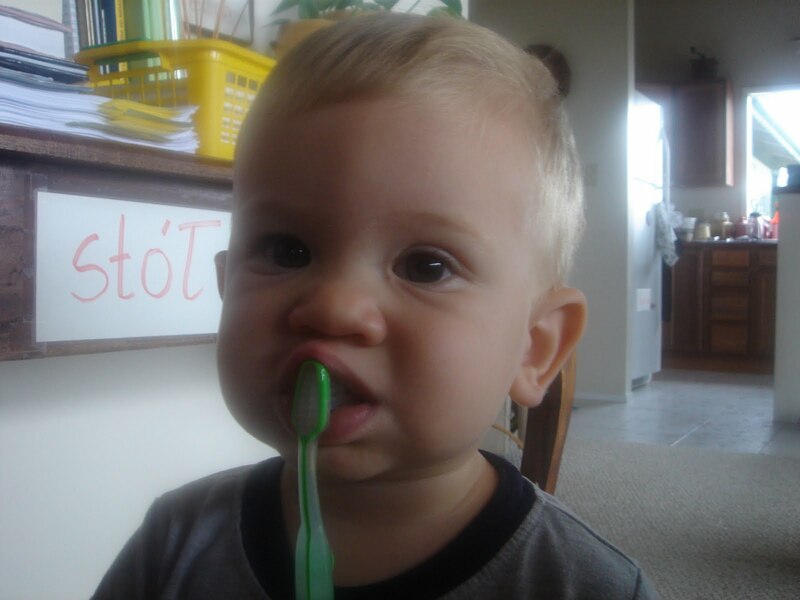 When Eaton was 12 months old I bought him first toothbrush. He was asking for it. He wanted to try brushing his teeth by himself. Playing with a toothpaste was even better! It's great to start teaching a baby good habits when they are little. There is no pressure associated with teaching because they naturally are eager to discover by themselves how the toothbrush works. They imitate you with everything you do and say, so why not to use it as a teaching tool since they are little. But I'm not talking only about brushing your teeth. Saying please and thank you is another example I started with Eaton since the beginning of our early learning journey. He is saying please and thank you to us most of the time already. Actually, he says "thanks" as his daddy says "thanks buddy" a lot to him and Eaton loves it! Once Eaton hears that over and over again he just applies that. It's great to hear the word "thanks" when you pass him a piece of an apple! My heart is melting! By applying this simple strategy of saying please and thank you to your baby you are able to get positive results. Your baby can follow your directions. Like simple activity of closing the door. Eaton is always in and out and closing the door is a must because of cats and bugs. Here is the short video of Eaton following my direction. You can also apply that to cleaning activity and putting toys away where they belong. Very important thing to mention is that we (parents) should be consistent with these habits once they are understood by babies. So start early! Be an example! Be a teacher of good habits and you will raise positive, happy and discipline kid!